Planners from the Department of Transportation, along with the Village Board and Sloatsburg residents, have been working for months on a plan to slow down traffic in Sloatsburg without taking it down to a crawl. The DOT came back to the village February 13 to speak to all concerned about the upgrades. The Sloatsburg exit/entrance from the NYS Thruway has been an alternate for many to bypass the Exit 16 toll booths. With two lanes going north and south, and many drivers ignoring the 35 MPH signs in the village, there was little room to make the heart of its downtown business district a more pedestrian-friendly place. Sandra Jobson, the Department of Transportation’s Regional Planning Director, and her staff, have held three workshops last year, gathering feedback and trying to come up with a solution to a vexing problem: How to make the village’s business area visitor/resident friendly while keeping traffic moving. Map showing potential changes still needs tweaking. 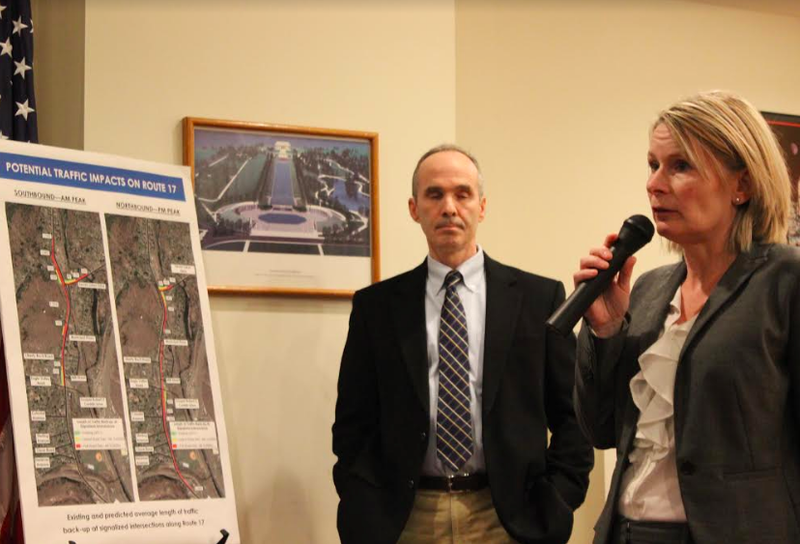 At the DOT’s last meeting with Sloatsburg in September 2017, more than 200 residents participated, opting for the “road diet,” which would turn Route 17 back to its original two-lane configuration, with a third road in the center to allow for traffic to turn left or right. Apart from beautifying the sidewalks, there was also a conceptual plan to add parking on the road, as well as a bike path. 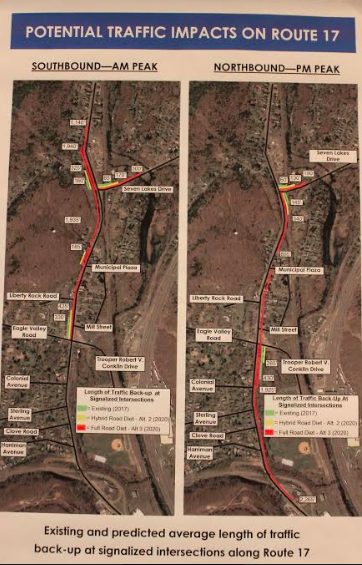 After having several engineers come in to assess the proposed change, Jobson told the Village Board and residents Tuesday evening that the number of cars and trucks surpass the 20,000 vehicle per day rule that would make the “road diet” plan feasible, since Sloatsburg hosts more than 24,000 cars a day at peak times. “Once people get past Eagle Valley Road or Seven Lakes Drive, traffic lightens up,” said Wright. The DOT and its engineering firm, Creighton Manning of Albany, have come up with a hybrid plan, one which would keep the four lanes of traffic in the heart of the village’s business district, while implementing the “road diet” plan for cars/trucks traveling south at the Seven Lakes Road light and picking it up again once traffic moves through Sloatsburg beyond Eagle Valley Road. The business district would have its sidewalks improved and a median placed in the middle of the four lanes so pedestrians can get across safely. Mayor Wright has also secured a $4 million TAP (Transportation Alternative Project) grant for sidewalks, “which are desperately needed in the outer parts of the village,” he said. Many of the homes built alongside northbound 17 have little or no frontage. Once a sleepy road that was the only way to get to the Catskills, it has become a major road for people coming off the NYS Thruway and from New Jersey. “Please be patient. We want to get this right, and we know you do, too,” Jobson told residents. “We plan to come back within the next month and have one more workshop using the hybrid plan our engineer has come up with and see if it can be improved.” Mayor Wright assured her the meeting hall would be filled to capacity with residents seeking to make life—and dealing with traffic—more amenable to those who live alongside the Route 17 corridor. One perk all residents of Sloatsburg and its visitors will appreciate: Plans also call for a complete repaving of Route 17.